Chi Vu (Survivor Corps in Vietnam - LSN-V): Chi spent two years of her childhood in refugee camps in Malaysia and the Philippines, where she received an exceptional education in NGO schools. In the years since, she has worked on several community initiatives, which include teaching Vietnamese language to kids in Little Saigon. She graduated from Yale in 2005 with a BA in English and certification to teach English at the secondary level. 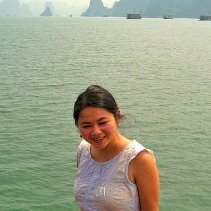 At the time of her AP fellowship, Chi was pursuing a Master’s degree in international educational development at Teachers College, Columbia University. After her fellowship, Chi wrote: "This Fellowship has deepened my understanding of the kind of cooperation and teamwork that is needed to effectively operate a grassroots organization, to successfully work for a cause that not too many people are familiar with. LSN-V is special in that it works closely with individuals at all community levels, from survivors to government officials. From these close working relationships, I had to opportunity to learn about how LSN-V works on an operational level while forming interpersonal relationships at the same time."